As a kid, one of my favorite lunches to take to school was the Lunchable. The fact that my lunch could be stacked on a cracker and it WASN’T a sandwich made me the cool kid for like, 20 minutes. We moved often in my elementary years and sandwiches were the norm, so my “cool kid” moments were few and far between. Unfortunately for my social status, about the time my family settled in Texas was about the time I outgrew Lunchables. Still, I cherished those moments when they did come, because really, who doesn’t like cheese and crackers? I remember Lunchables being very simple back then: Crackers, meat and cheese. There were no drinks, no desserts and definitely no smoothies. Now Kraft has five different lines of Lunchables for a total of 45 flavor combinations, all with one common underlying theme: Extremely processed ingredients. You can’t pronounce most of the ingredients. You won’t find most them in your kitchen (or the grocery store, for that matter). There’s a 95% chance every item in the package has either high fructose corn syrup or hydrogenated oils – the two biggest additives you should be concerned about in terms of real food. Now that doesn’t mean you shouldn’t be concerned about other additives too, because there are PLENTY to choose from on the back of those little yellow boxes. Carrageenan, sodium nitrite, soy lecithin, MSG (in more than one form), annatto and three different types of artificial sugar should be enough to get your brain juices flowing, and your blood pumping too if you hate additives as much as I do. So in addition to offering healthier, homemade options for soft pretzels and hot pockets, I’m offering a real food version of lunchables too. As of today, you should be fully armed to get your kids through a full week of school without having to rely on convenience foods for either lunch or after school snacks. The fact that you can do it all without spending a lot of time, or a lot of money, is a nice little bonus too. 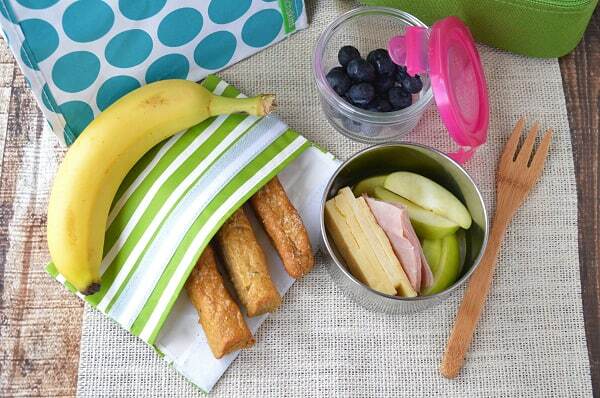 Coming up with a healthy homemade lunchable is not rocket science. I mean, if Kraft can put crackers, meat and cheese together in a box and call it lunch, why can’t we? The key is to simply choose better ingredients. Homemade lunchables are incredibly easy to put together and in fact, we’ve been eating them for several years now. 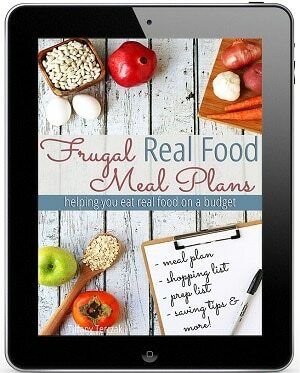 Recognize “snacky lunch” on the monthly meal plans? As to what you want the starch to be or what type of protein is packed, the sky is the limit! The easiest (and cheapest) way is to simply pack whatever you happen to have in the fridge, and that’s also a great way to use up leftovers. But of course, don’t let what’s in the fridge, or not in the fridge, hinder your! 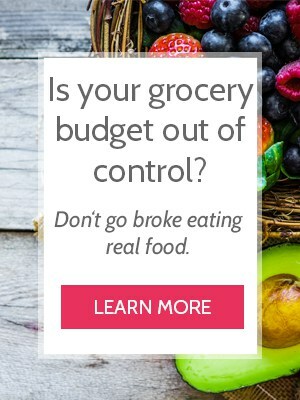 * If organic, non-GMO or nitrate-free items are not in the grocery budget, simply buy the best you can afford. The easiest way to pack homemade lunchables is in a divided container like this one. Note that while it’s BPA-free, it’s not leak-proof, so you’ll want to pack liquid items in a separate container. These silicone muffin cups are a simple way to separate items that don’t need lids, like crackers, slices of cheese or cuts of meat. They’re flexible and can easily fit into nearly any container you already own too. They double as – you guessed it – muffin cups, but I’ve also used them as a molds for lotion bars and homemade fudge. The reusable bags you see in the photos are Lunchskins. I love using those for packed lunches instead of baggies! Right now you can get a set for $3 with MightyFix. 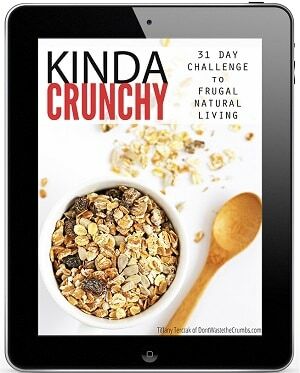 A monthly subscription that makes the baby steps to sustainable living so simple. Read more about it HERE. 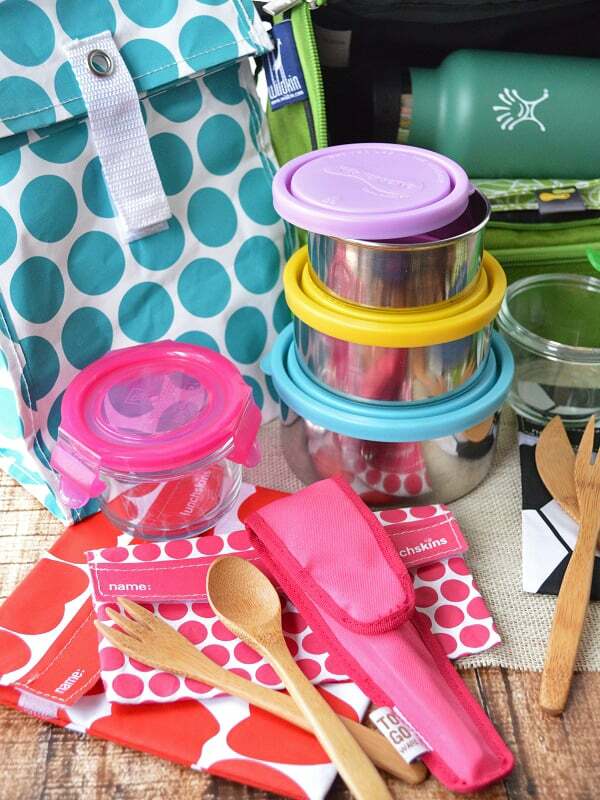 Remember though, that you don’t need special equipment or storage in order to pack a healthy, frugal lunch. The most affordable route is always to use whatever you have on hand. Just make a mental note to add these to the Christmas and birthday wish lists this year. Update: As my kids have grown and they need a little bit more food for school, I’ve found that the Planet Box LAUNCH box is our favorite. You can read all about my lunch box experiences HERE. Compare that to the $3+ that a single package of turkey and American cheese (which isn’t even really cheese, by the way) costs at the store! 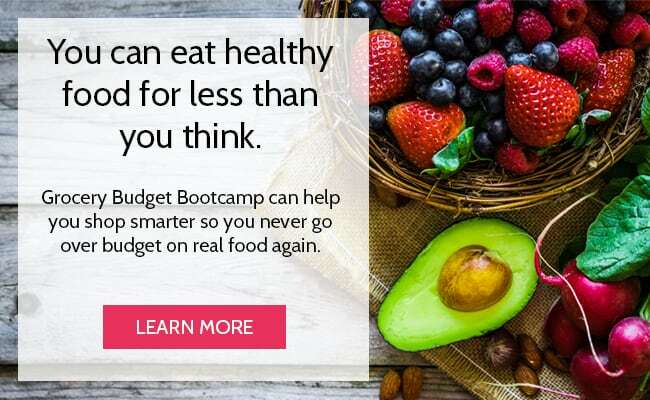 They key to keeping real food lunchables affordable is by packing food you already accounted for in the grocery budget, like leftover chicken or fruit or items made homemade from scratch. Offer more of the frugal items (like bananas for just 20¢) and less of the higher end items. Also, find creative ways to serve the not-so-pretty-yet-very-frugal items like beans. Kid-friendly hummus (like this pizza variety) with lots of dippers is a great place to start, and the extra affordability of beans means you can splurge a bit on blueberries or other fun seasonal fruit. Of course, don’t forget to pack a drink too! Water or kombucha from home is free, but you can add frozen strawberries or flavored ice cubes for a fun treat. For more school lunch ideas, check out “The Healthy Lunchbox” – it’s one of the best eBooks I’ve read on healthy lunches, including back to school! Homemade lunchables are a fun way to pack lunch or dinner, and we’re actually packing a grown-up version for dinner tonight: proscuitto with brie, sourdough & grapes. 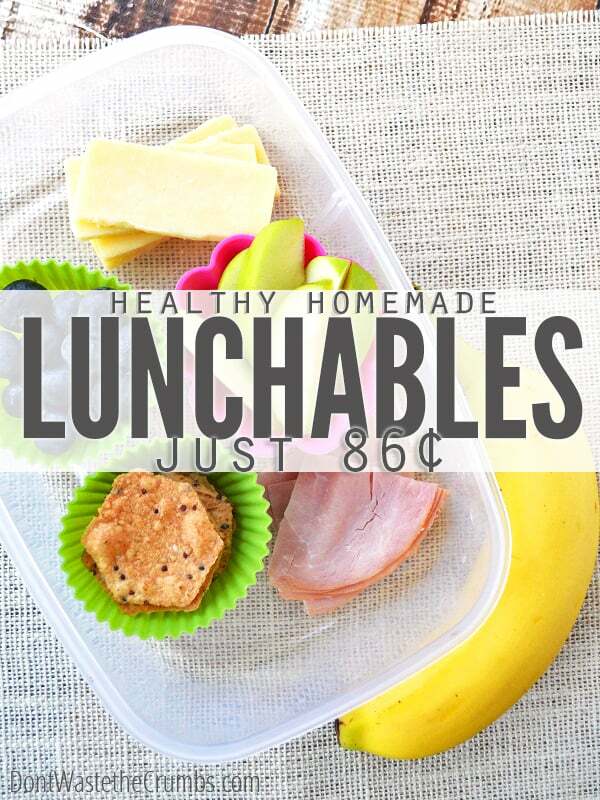 Healthy Homemade Lunchables are featured in my FREE Two Week School Lunch Menu! 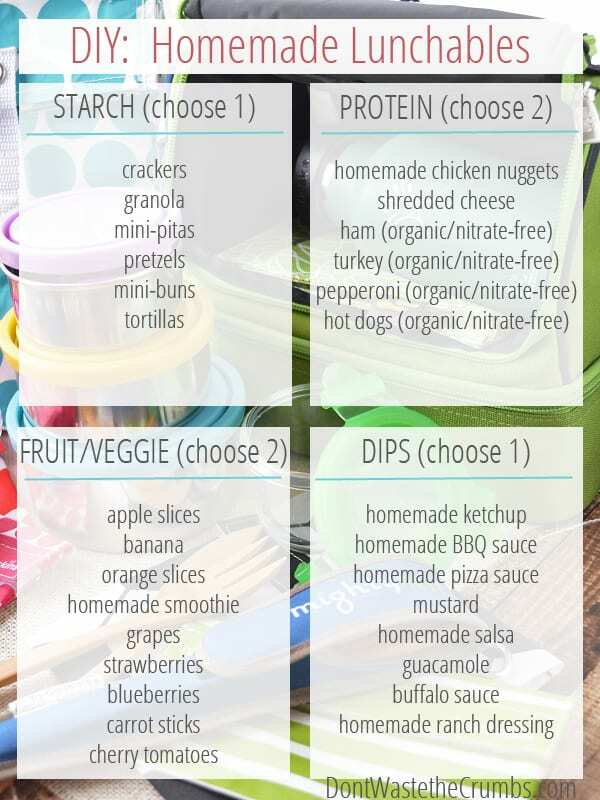 Get a full two week meal plan to feed your kids healthy school lunches on a budget. You’ll love it! What would you put in your own homemade lunchable? « How Much Food is Enough? Thanks for the post, just in time for the start of school!! My kids are always asking for Lunchables because their friends have them for lunch. You’re welcome! I have a feeling that many parents are in the same shoes as you, so hopefully this makes the “no, you can’t eat junk for lunch” talk a bit easier! Thanks Kelly! I really like the freedom to mix/match with what I have on hand too. Makes it easy to tailor to each kid’s favorites, while not needing too much of any one thing at a time. Thanks for sharing!! 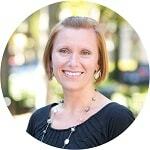 You are probably getting sick of me commenting…..but I”m just loving your site! I’ve just spent 20 minutes clicking through a bunch of “healthy lunch ideas” pins on pinterest and every single one was a huge disappointment except for this one. Thank you again for your fantastic site. You are inspiring. 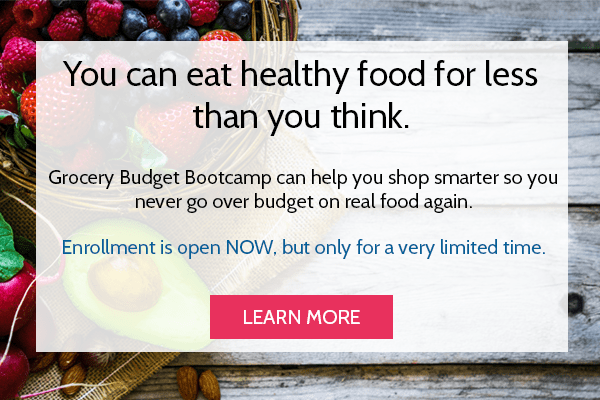 I hope to be where you are (budget and “real food” wise) in a year or so! Yum! I’m thinking I need to make lunches like this for myself, as well! Thanks for the ideas! My older kids have made their own lunches for years but now I have a Kindergartener — this has inspired me to try this. 🙂 Thanks! Going to share on my social media too! I’m happy it’s inspired you Hilary! I’m sure your Kinder will love it – mine does! Thanks so much for sharing! Thank you for some great ideas! I’m wondering, though, do you have to trust that if you send an ice pack to keep things, like protein, cool, that your kids won’t end up throwing it in the garbage? I’ve been frustrated when my kids toss my small Tupperware containers, so I tend not to send lunches that need to stay cool for that reason. I guess you would have to trust that your kids not throw reusable items away… I’ve read other moms who have a “no trash” rule, where EVERYTHING comes home, trash and all. It might be gross, but your dishes avoid the trash can. Another option is to freeze some items and let them thaw as the day goes on. They can be a natural ice pack for the items that need to be cool. Hi, I used to get frustrated also. Trying to keep lunches cool and not loose the containers. I have found lunch bags that you freeze over night and then pack in the morning. lasts my children at least two years. Thanks for sharing a great tip Tracy! Thank you for these great ideas! My daughter has been asking for Lunchables and I love having these alternatives. One question: do you find that the guacamole turns brown by the time lunch rolls around? I tried packing it once and it was pretty unappealing by the time she found it. We just bought the divided bento containers and the silicone muffin cups. The kids and I have a great time creating their own lunchables at home. The little one eats alot more of her lunch now. I’m not lactose intolerant, but I don’t eat cheese, so if I was to make a homemade version of a lunchable, I wonder what an acceptable substitute would be to put in there? The kind of veggies I like are lettuce, corn, peas (the frozen kind), and French cut stringbeans. As for fruits, I like mangos, kiwifruit, peaches, pears, strawberries, and bananas. With dried fruits, I like mangoes, kiwifruit, peaches, pears, strawberries, raisins, and cherries. For protein, I like yogurt, and creamy peanut butter. When I told my mom about your recipe for chocolate hummus, she found it rather interesting. Chocolate and garbanzo beans, she thought, makes kind of a strange combination. I like to make a lot of stuff from scratch now, since I have a Kitchenaid mixer at home. For example, I make an egg-free, oil-free version of mayonnaise, which I like to call “Magnificent Mayonnaise”. Usually I make a mild version, but I’ve also made “Medium” and “Sweet ‘N’ Savory” options. The main ingredients are: plain white vinegar, stevia, mustard, and the most important ingredient of them all … Plain Greek yogurt! For the mild version, I use 1 tablespoon of plain white vinegar (More would make it too sour), 1 packet of stevia (the Sweet N Savory version has 5), 6 tablespoons of yellow mustard (the Sweet N Savory version has Dijon mustard), 64 ounces plain Greek Yogurt (I use the whole milk version, as I like the resultant mayonnaise to be nice and thick). You can use nonfat or low fat if you like. My preferred brand of Greek yogurt for this recipe is Zoi. 1-½ teaspoons of Salt grinds (I use Morton Seasalt), and 1/8 teaspoon of pepper grinds (the Sweet N Savory version has ½ teaspoon!). I strain the yogurt in a fine mesh strainer covered with a towel in the fridge, then I use the leftover whey for things like smoothies and protein snacks. Then I mix the vinegar, stevia and mustard in my mixer, along with the solids from the Greek yogurt, and the salt and pepper grinds. I then scoop the mix into an old mayonnaise jar, cover and let set in the fridge for up to four hours, and voilà! You’ve got a nice jar of Magnificent Mayonnaise! I know this isn’t what most people would call “traditional mayonnaise”, but it’s less fattening! And on top of that, it’s actually something that’s good for you! I even eat eggs more often now, since I just bought a Dash Go egg machine recently (http://www.storebound.com/dash/dash-rapid-egg-cooker), and I wanna tell you, the scrambled eggs I make taste amazing! I tell my mom that they look like “Scrambled Eggburgers”! They got that nickname from me because they actually take the shape of the pan when they’re cooking. The cool thing about this machine is you can make eggs any way you like, and all you have to do is add a little water to the bottom of the machine, put the boiling tray on (always do this otherwise if you put the other components on without it, they’ll melt and burn!). For hard-boiled, medium-boiled, or soft-boiled eggs, pierce the fat side of the egg with the pin attached to the measuring cup provided with the machine. Be careful, it’s sharp! Otherwise, put any other components on if needed. For scrambled eggs, use the round “scrambling pan”) (which also doubles as an “omelet pan”, Or for poached eggs or even personalized omelets, use the “poaching tray”. plug the power cord into a socket, and push the button on the front to turn it on! Then the magic happens when the water turns into steam and cooks your eggs, along with any fillings and fixings you add to them. Depending on how you like your eggs, the machine lets you know when they’re cooked with a beeper. The beeper goes off when the water has evaporated from the bottom of the machine. I gotta warn ya, it’s a bit loud! Depending on the amount of water you put in the machine, eggs can take anywhere from 6 to 12 minutes to cook. Less time than it takes water on the stove to come to a rolling boil! I usually measure the water in one of my measuring cups first, since they have Braille on them, which is engraved on the top of the handle, and a convenient pour spout on the other side, then I pour the water into the measuring cup that comes with the machine. Then I pour the water into the heating plate, on the main body of the machine, put the boiling tray on, then the scrambling pan with all the scrambled egg fixings. Then I put the cover on, with the steam hole in the back so I don’t get burned, lock it in, plug in the power, then push the button to turn it on! Easy as pie! I even have an Air Fryer made by Farberware, and I cook frozen French Fries in there, without any extra fattening oils, with no problems at all. I even make bacon in there, and it cooks in 10 minutes! I can even reheat Shake N Bake pork chops and chicken in that machine, without anything smoking or burning! I recently started making a homemade version of ranch dressing, because when I used to buy the store bought version of Hidden Valley Ranch dressing, both in packets and in bottles, I had no idea what most of the ingredients were, as I believe you’d have to have a Ph.D. in science just to figure out how most of them are pronounced! I make my ranch dressing mix with ingredients I buy in bulk from places like Winco and Market Of Choice. Here’s my recipe for homemade ranch dressing. 5. Squeeze on a salad and enjoy! My grandson is SO picky an eater, that he will ONLY eat one brand of lunchables….the other doesn’t have the ‘right’ shapes/sizes. I tried keeping the containers, and cutting lunchmeat and cheese as close as I could. Can’t fool him…It will prove to be interesting when he starts kindergarten this fall and can’t eat what he ‘likes’ to eat. I’m hoping it will expand his horizons a bit. If he gets hungry enough, maybe he will start to explore more…. I am in love! I hope you don’t mind – I used some of your photos as a resource in my ode to getting rid of Lunchables for good! One kind of dish I like is orange chicken, like the kind that comes from Safeway. However, it’s really spendy! $10.00 for a large box! So that brings up my question. How would I be able to make this from scratch? I’ve seen several orange chicken recipes on Pinterest. The ones I’ve made from scratch haven’t been hard at all! The one I’m thinking of kind of looks like chicken nuggets, but they’re coated in an orange glaze, and they’re crunchy like Chinese sweet n sour chicken. I asked someone at Safeway what the recipe was, but they didn’t tell me. Either they didn’t know what the ingredients were, or perhaps it’s top secret. I’d like to make a recipe that tastes like the orange chicken at Safeway, but I’m not sure where to start. Usually you can find it at their deli counter, and it’s the one where a large box is $10. Do you have Safeway in Texas where you live? Maybe you can buy some of that at their deli and try it. Once you do, believe me, you’ll be hooked! Maybe even the kiddos will like it too. I know I do!